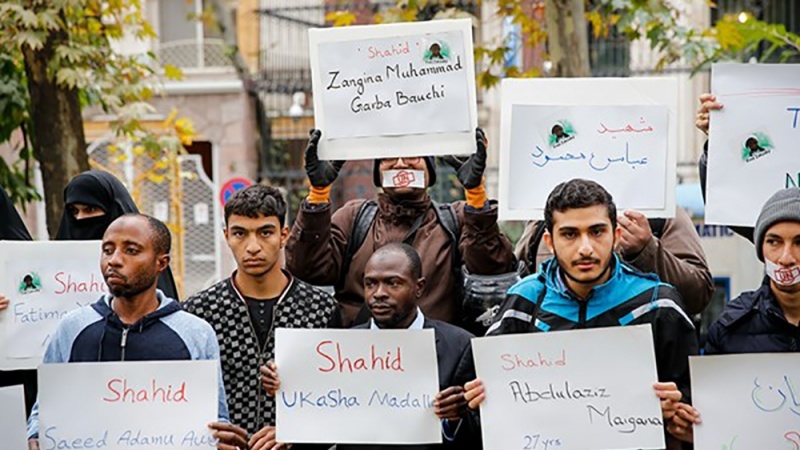 A group of academicians and ordinary people gathered in front of the UN office in Tehran and condemned the Nigerian government’s crackdown on Muslims. The demonstration was held on Tuesday, after Muslim authorities announced on Monday that the number of the people killed by Nigerian security forces during Arba’een ceremonies last week has risen to 47. Chanting slogans, the crowd voiced their strong protest, while some of the students among the demonstrators held placards with English and Arabic messages on. One of the areas of demands the protesters insisted on was immediate release of the innocent Muslims held captive by the Nigerian security forces. Chairman of the Islamic Human Rights Commission in London Massoud Shajareh was among the participants who denounced the Nigeria’s onslaught against the Muslim nationals of this country. “Today the Islamic movement in Nigeria is supported by 19 million Nigerian nationals and (this huge crowd of supporters) is the fruit of Sheikh Zakzaky’s efforts,” he said. Nigeria’s crackdown on Islamic Movement of Nigeria, IMN followers began in December 2015, when the army attacked a religious ceremony in the city of Zaria in northern Nigeria. State forces later raided the house of IMN leader Sheikh Zakzaky and arrested him after killing anyone attempting to protect him. More than 350 Nigerian Shia Muslims were killed in the brutal onslaught, including three of Zakzaky’s sons, only to be later buried in mass graves.